I am probably a bit suspicious, but I always keep my credit card receipts, and check these off against the monthly statements. I have been doing this for at least 10 years. Mostly using GNUCash which makes the process of reconciling these pretty quick. Over that time I have found a few mistakes, some in my favour, things that I have never been charged for, and a couple of things not in my favour. Like double charges for things, or fraudulent transactions, mostly these are easily rectified. Some of these have been identified by the Bank and rectified before I find them, sometimes not. So the era of pay-wave where you generally don’t get a paper receipt is now coming. I personally have resisted this until I was asked by my employer to trial a new service. This allows me to receive a text message whenever a transaction meeting certain criteria is authorized. The text messages are a huge peace of mind. This I have a record of every transaction, when it happens, including the place and amount. So I don’t feel the need to keep every receipt, and reconcile it to statements. I hope this catches on and is used by many more banks. I had an interesting set of text messages yesterday from my Credit Card provider, MBNA. 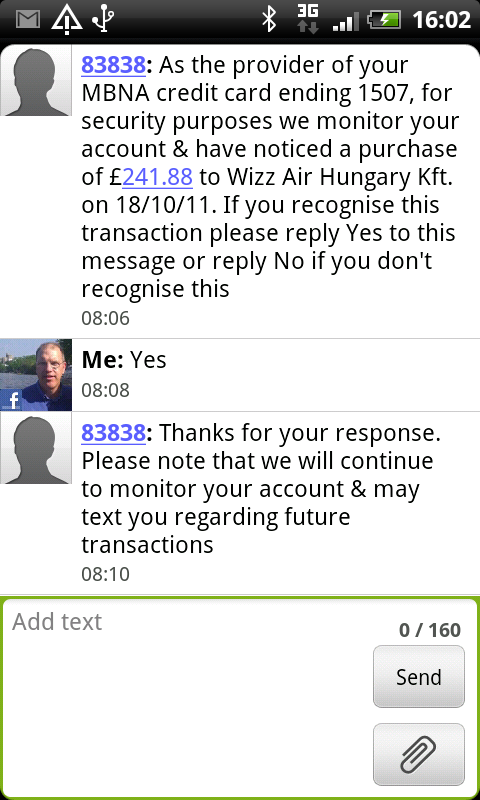 I purchased a airline ticket from Wizz air, but the ticket was from Hungery to UK return. So I would not have been surprised that it looked strange to their fraud systems.